When creating a video contest on Instagram with user generated content (UGC), expanding your social media reach and brand awareness with personalized videos can be a powerful marketing strategy. This article and video will show how to create a personalized videos from Instagram videos using specific tags. Instagram has 300 million monthly active users. It has grown into a global community that shares more than 70 million photos and videos each day. Instagram has more than 75 daily users. How can you make personalized videos from Instagram Video tags? All you need to have is a Sezion and a Zapier account. 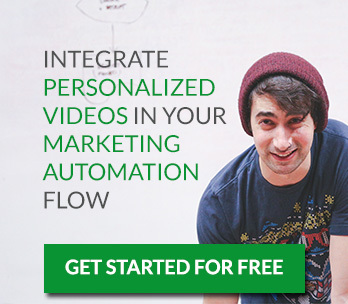 Sezion is a service that helps you automatically generate personalized videos from any content feed in minutes. Zapier gives you the power to integrate Sezion with hundreds of other apps to automate your work. For example: Instagram + Sezion. By doing this, when a specific Instagram tag is used, Sezion will automatically make a new video video containing the new tagged media. What are triggers and actions? New Liked Media: Triggers whenever you like a photo or video on instagram. 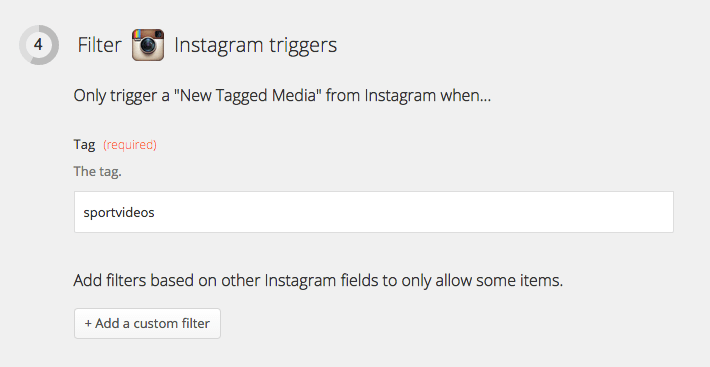 New Tagged Media: Triggers whenever a photo or image with the specified tag is posted! New Media Posted: Triggers when a photo or video is posted to your account. New Follower: Triggers whenever the authenticated user has a new follower. New Media From Feed: Triggers whenever a photo or video is posted by the people you follow. New Media by Location: Triggers when photos or videos are posted near a specific geographical location. When Zapier combines Instagram and Sezion with the specific trigger we chose, Sezion instantly makes a video. Within your Sezion account you can choose where you want that video uploaded to: YouTube (it’s really easy to add your YouTube Channel to your Sezion account), Amazon S3 or Sezion. Also with the Sezion API you can send the generated videos to any video hosting provider. 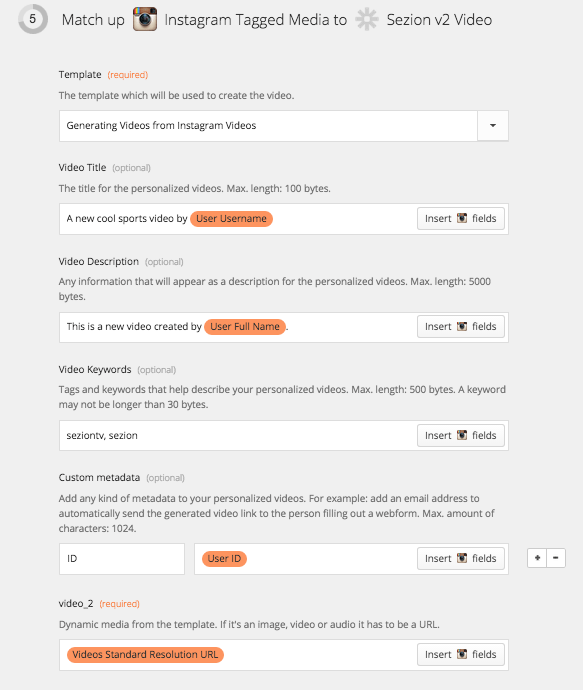 What information is required by Zapier to make personalized videos from Instagram Video tags? 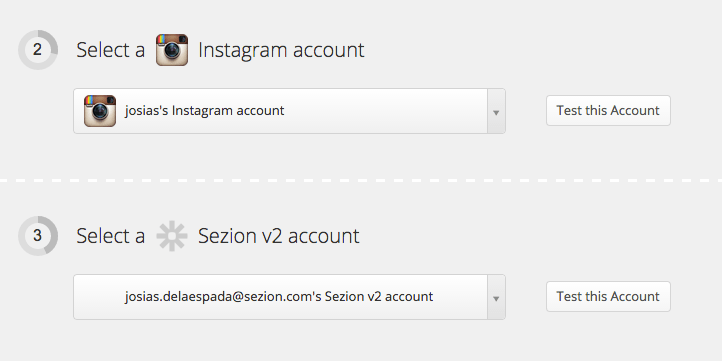 First, you’ll need to connect your Instagram and Sezion account to Zapier. Learn how to connect your Sezion account to Zapier. If you choose the “New Tagged Media” trigger, you need to add the specific tag that will be triggered. In my video tutorial I used the tag “sportvideos”. You can also use custom filters to, for example, only generate personalized videos when a specific user uses that mentioned tag. The Sezion Video Template which will be used to create the video. You’ll see a list with your video templates. Depending on the template you choose, Zapier will automatically show you the Dynamic Media from Sezion that every template has. Dynamic Media within Sezion are the different elements (texts, images, audios, videos) in a template that are variable and can be different in every final video. That’s what makes a video personalized. In this case, the inputs or data coming from Instagram (for example: a video URL, a user ID, a user screen name, location, etc. ), that will be shown in the final generated video. Learn how to use, install and create a Sezion Video Template. The title for the video. Zapier gives you the option to insert a field coming from Instagram, depending on the tag you chose. You can combine those fields with typed text. For example: A new cool sports video by (typed text) User Username (inserted field from Instagram) . Any information that will appear as a description for the video. As with the Video Title, Zapier gives you the option to insert one or several fields coming from Instagram. You can also combine fields from Instagram and typed text. Don’t forget to learn more about how to write effective YouTube description to improve SEO. Dynamic Media Example – Zapier. Use the “Video Standard Resolution URL”. Every personalized video generated with Sezion has Dynamic media. Dynamic Media helps you create a batch of unique videos featuring text, images, audios and videos from Instagram (or any other service). If it’s an image, video or audio it has to be a URL. In the video example I only used one Dynamic Media: the video being rebranded or re-used to generate a personalized video. If we are talking about using images, audios or videos as Dynamic Media, then it has to be a URL. For Instagram, the right field to use videos as Dynamic Media as I did in the example would be “Video Standard Resolution URL”, as you can see in the screenshot. Create a free Sezion account. Create a free Zapier free account. You’ll find Sezion in the “Action” site. You can now automatically generate videos based on real time data from Google Docs Spreadsheet. If you want our team to help you with your next video generation project, please let us know. We are here to help! Personalized Videos, Video Marketing, Zapier how to generate videos from instagram videos, instagram contest, instagram videos, marketing videos, personalized marketing videos, personalized videos, zapier. permalink.